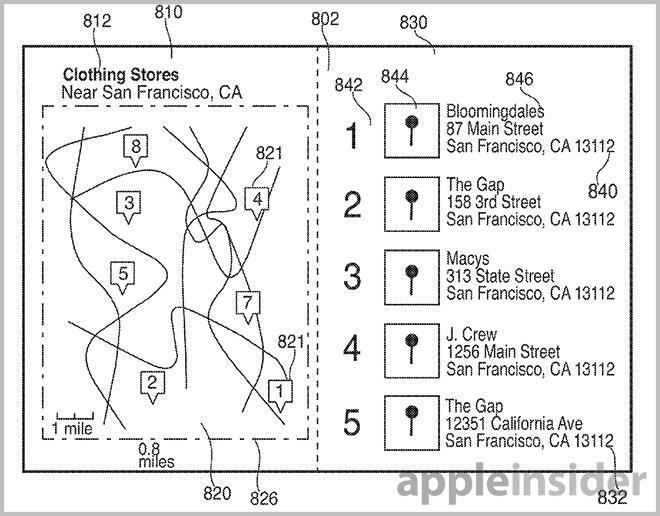 An Apple patent application published by the U.S. Patent and Trademark Office on Thursday suggests the company may be looking to build out its mapping service, as the filing describes a printing function not currently supported by the iOS-only feature. 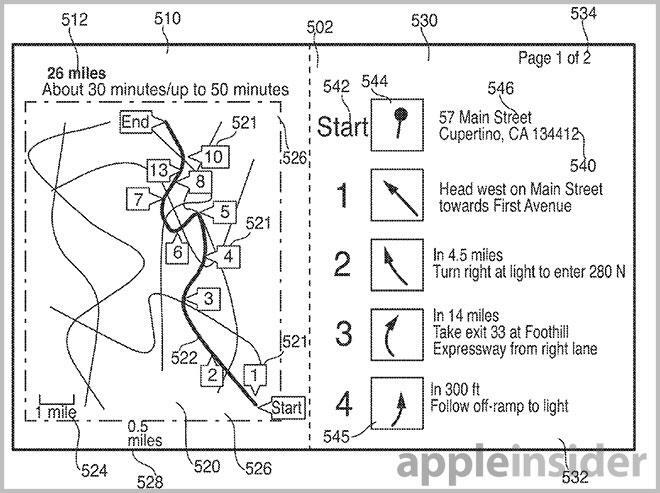 Apple's "Systems and methods for printing maps and directions" patent filing discusses a process of printing out on paper navigation and mapping assets stored on a computer or portable device. While identical systems have existed for some time, Apple's Maps app has yet to support the functionality. The invention is largely self-explanatory, and calls for a device to print out directions based on a request to do so, laying out a map overview and distinct steps along the route for easier navigation. In one example, the map overview and listings are aligned in columns across a landscape printout. Mobile devices, like Apple's iPhone, boast GPS positioning systems and software that can create routes and interactive maps, but the company notes these services may not always be available. In some cases, a physical printout that doesn't require a cellular or GPS connection may be needed, but existing methods are not user friendly. In use, the invention prints out a route from a mapping app in a layout "optimized for directions" where the entire route and corresponding turn-by-turn instructions are readable. Such a layout could be a landscape-oriented paper with a first column shows a geographic overview, with a proposed route highlighted. Callouts arranged on the route are sequentially numbered and correspond with a second column of distinct steps which are represented as detailed map tiles. If the route is inordinately long, with too many directions to fit on one page, a plurality of pages can be printed out. However, the application points out that the first column of each page contains a map overview, while sequential callouts are listed in the second column. Some embodiments allow for points of interest to be shown and described on the callout list. Information regarding each POI can be located in second column, while callouts are disposed on the route overview. Illustration of points of interest. The filing goes on to explain proper scaling techniques, transparencies and other details that would make the printout more user friendly than current solutions. While fairly banal, the filing does include interesting notations regarding mapping services. For example, specifically stated in the application's language is support for Web-based mapping software. Currently, Apple's Maps app is not available online and can only be accessed by the dedicated iOS app included with the company's mobile devices. It remains unclear if Apple is looking to bring its Maps assets to a wider audience, but the company may hold off on such expansion until the service's existing troubles are dealt with. 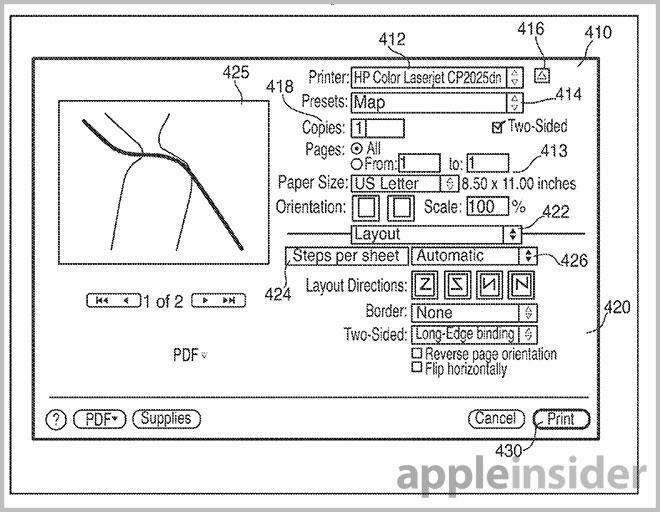 Apple's map printing patent application, which is related to a 2011 application, was filed for in 2012 and credits Bradford Moore, Christopher Blumenberg, Marcel Van Os, Albert Dul and Tiffany Jon as its inventors.